As a Department of English, we educate students to become better readers, writers, listeners, and speakers. We teach students to read for an investigative comprehension of essays, stories, novels, plays, and poems. We encourage students not merely to read for literal meaning, but to think critically and interpretatively about an author's audience, premises, purposes, and rhetorical strategies. Our students learn to take pleasure in the construction of a writer's imagination. Our students learn to write not only by adhering to conventions of rhetoric, spelling, grammar, and paragraph structure, but also by finding and displaying their emerging voices in compositions that express clear, distinctive ideas. We teach our students to proofread, edit, and revise their work. Our students learn the principles of research: how to actively weigh the quality of sources and accurately document those sources. We shape our classroom into seminars where relatively small groups of students pay close attention to texts, learn to make perceptive contributions to class discussion, and listen to each other while inquisitively sharing responses to literature. In a climate of collaboration and respect, our students learn how to think, write, and speak independently with logic, conviction, and imagination. The Fisher-Landau Department provides academic support and guidance to the student body. The Department is committed to demystifying the stigma of learning disabilities and to fostering the academic success of any boy whose educational evaluation indicates the need for a clearly articulated description of learning style and appropriate intervention and accommodation. To this end, the Department provides support to students with diagnosed learning disabilities by working with faculty, families, outside specialists, as well as through direct intervention with the student himself. Within the context of this model, the members of the Department serve as a resource to all constituencies of the school community in order to accomplish two goals. First, the Learning Specialists provide faculty with pertinent information about a boy's individual strengths and relative areas of need. Second, the Learning Specialists work directly with students in helping them to organize their assignments, to structure their study time, to devise study techniques that correspond to their individual learning styles, to decode the "unwritten" rules of the classroom, and to encourage students to meet with their classroom teachers when there is need for content-specific guidance or clarification. Thus the Department helps to ensure that each student is poised to achieve the academic success commensurate with his potential. The Department also works directly with faculty to foster a common understanding of how to match the rigor and demands of curricula throughout the school with specific academic skills and tools that will allow all our students to endeavor any academic query with a clear sense of strategy and purpose. Through work with faculty and students, the Department helps all Collegiate boys develop the skills necessary to become independent thinkers and problem-solvers. The Department guides the boys in each division to endeavor and complete any academic task by gaining awareness of what skills are required, and then identifying and implementing appropriate strategies in order to successfully complete that task. 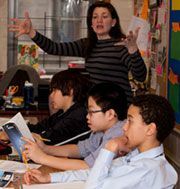 The Fisher-Landau Department's goal is to work in tandem with the overarching goals of the school: "to educate each boy to his highest level of intellectual, ethical, artistic, and physical development." As our students graduate from Collegiate, they will have had the opportunity to work their way through many challenges that have required a systematic and thoughtful problem-solving approach. And so, they will rely on their own understanding that all problems are to be approached with a combination of curiosity and humility that balances their desire to be right with a willingness to be wrong. By guiding students to analyze and endeavor the problem-solving process, the Department hopes that students will maintain a sense of awe as well as an inquisitiveness that drives them to use the best parts of their character and intellect as they continue to explore, discover, and learn. Modern Languages: Modern Language classes seek to provide each student with the required tools for effective communication and cross-cultural understanding in our increasingly globalized world. Given the interrelatedness of language and culture, the department emphasizes teaching language in context, guiding students in the exploration of literary texts, media, and other culturally rich materials, in order to cultivate an appreciation of ideas and broaden awareness of the links between language, self, and society. Students first acquire from their studies knowledge of the essential vocabulary, grammar, and styles necessary for a basic degree of proficiency in the target language in each of the four skills of reading, writing, listening, and speaking. By developing these skills, they become self-aware practitioners of life-long strategies applied in the study of any foreign language. In addition, they gain an understanding of historical, socio-cultural, and political issues and sensitivity to a wide array of cultural differences, whether in food, music, religion, sets of ideas, or specific literary works, for any country where the target language is spoken. Upon graduation, our students should have the ability to communicate correctly in the target language in all modes; to appreciate and compare different cultural products and forms (e.g., artistic traditions, literary genres, philosophical developments); and to connect to other cultures through travel, technology, or integrating themselves into sectors of our local society that predominantly speak the language they have studied. Classical Languages: Students who study Latin and/or Ancient Greek at Collegiate may expect to achieve mastery of the basic vocabulary, morphology, and syntax of Latin by the end of the first semester of 10th grade and of Greek after three years of study. This mastery is gained by dedicated memorization, regular drill work, careful grammatical analysis of many sentences, and translation of passages both synthetic and real. Students of classical languages are exposed to many great works of Greek and Latin literature in many genres and have opportunities to study prose style, metrics, and poetic diction. After several years of study, Latin and Greek students should be able to translate texts of the major authors, both in prose and poetry, and by reading ancient texts in their original languages should evince both an understanding of the thought and an appreciation of the remaining mysteries of what they translate. Mindful that students learn in different ways, teachers use a variety of approaches and materials. Teachers seek to develop the reading, writing, speaking, listening and critical thinking skills of every student, with the ultimate goal of teaching him to think and to write clearly. Students need to read critically and to recognize the differences between primary and secondary sources. They should become more adept at listening and at expressing their views in class. Students need to develop their skills in taking notes and in writing history essays and papers, which differ from written work in other disciplines. Students learn how to cite sources properly and to conduct research in primary sources, history books and articles, and data bases. They also learn how to evaluate and use online sources. to participate in a sport will be encouraged to develop his skills to the greatest extent possible, regardless of his beginning skills or abilities. Through interscholastic athletics, an opportunity is provided for students to achieve well beyond the levels expected in the physical education classes. Participation in athletics provides experiences which are designed to fit harmoniously into the overall educational program. Vigorous physical activity is vital to healthful living, and athletic endeavors are founded on a clean and disciplined life. The library acts as a gathering space for students, faculty, and parents to become a thoughtful community of learners and develop the habits of mind to appreciate and make sense of the vast number of resources available. The library’s goal is for each person to become an information literate scholar and to appreciate the power of story. We join the academic departments in teaching the skills needed to access and use information, which include the selection, organization, presentation, and ethical use of materials. Moreover, the Library serves as a key place in the school where students learn that seeking a variety of perspectives, exercising vigilance in detecting bias, and protecting intellectual freedom are essential endeavors of responsible citizens in a democracy. As the Collegiate students become confident in navigating the immense body of knowledge from the past, they will be inspired to create informed and innovative ideas for the future. The central goal of the Collegiate School Mathematics Department is that all of our students appreciate and understand mathematics: the beauty, the structure and the usefulness. Problem solving (analysis, description, decision-making, prediction) is the key to a solid mathematical foundation, and we prepare our students by developing number sense, algebraic and geometric fluency, estimation skills, and the ability to predict and then analyze results. Setting up and solving real world problems and communicating solutions in written, oral and graphical form is central to the learning and enjoyment of mathematics. It is our hope that all of our students will thereby find areas of mathematics which they admire and can put to use in their lives. The Music Department strives to promote excellence in music by creating meaningful experiences through performance, understanding, and appreciation of the art of music. We aim to help students develop their individual talents and interests as well as cultivate their musical and artistic development. Further, we want students to explore the areas of expression and imagination. We believe that every student should be given the opportunity to learn music and to share in musical experiences. We work to foster self-confidence, creativity, responsibility, and self-expression. The Department seeks to provide K-12 students with opportunities to develop skills in each of the areas of: General Music, Music Appreciation, Vocal Music, Instrumental Music, and Music Creation. The Department also promotes a high standard of excellence, a passion for life-long learning and enjoyment, through the highest level of comprehensive musical study in a supportive and challenging environment. Additionally, every year, we produce sixty to seventy student performances, both on and off campus, through assemblies, recitals, concerts, and concert tours. The physical education program seeks to provide a balanced, varied curriculum that addresses health related fitness concepts and motor skill development. The program will aid in the development of fundamental motor skills so that each student may become competent in the use of these skills. Competence in movement contributes to the enjoyment of participation in physical activities and provides a foundation in which to continue skill acquisition. The program will help students acquire an understanding of the concepts of physical fitness and how it relates to their health. The program will also provide each student the opportunity to develop and maintain a level of physical fitness in relation to their individual ability. Various fitness and sport activities will not only enhance their level of fitness but also encourage fitness as a way of life. Students that engage in daily vigorous physical activity will increase the likelihood of them being physically active in adulthood. The program will aid in the development of a positive attitude toward physical activity so that each student might seek and enjoy recreation during their leisure time. A positive self-concept through the physical education experience can be developed as well as the concepts of good sportsmanship and cooperation with others. The Religion Department seeks to offer courses that are broad in scope and often inter-disciplinary in approach, yet also deep and personal. Our courses try to honor the same balance of rigorous intellectual inquiry and existentially urgent self-discovery that informed the school's curriculum at its founding by the Dutch Reformed Church. Additionally, we are eager to respond creatively to the dynamic, pluralistic school and city of today, where almost the whole spectrum of religious traditions and practices can be encountered and explored. Drawing whenever possible upon this unique environment, we hope to ask questions that will linger in the minds of our students well beyond their time at Collegiate. Thus, our offerings will include courses in particular religions and sacred texts, theology, philosophy and ethics, sociology of religion, religion and the arts, science and religion, etc. Questions of personal identity, in all their complexity, will be central to our work. Of course, we recognize that helping students explore views of the world that are explicitly not secular may be foreign to some. While we seek to be personal, we do not seek to be creedal. Some of us are people of faith; others are not. But as scholars and New Yorkers, we have come to recognize that some of civilization's most ancient questions and responses continue to animate modernity, and we believe a Collegiate education can only be complete if it offers students some perspective on such questions. The Science Department provides a K-12 program which stimulates enthusiasm for the subject, creates a community of students and scholars, and builds a solid foundation for the life-long appreciation of science. The curriculum emphasizes problem solving, using methodical approaches and through intuitive reasoning, and the development of scientific literacy. Our goals include teaching students through hands-on, inquiry-based learning and through evaluating evidence and information. The department stresses the importance of research skills and quantitative reasoning using various methods of investigation including observation, comparison, experimentation, and interpretation of data. Our overarching objective throughout the curriculum is to foster students' critical thinking skills, such as drawing conclusions, inferring relationships, solving problems and making predictions about the natural world. Ultimately, the Science Department is committed to showing students that science is interdisciplinary, has practical applications, and has to be understood in a larger cultural and societal context. The mission of the Collegiate School Technology Department is to educate students, faculty and staff to effectively use technology in a rapidly changing society. We focus on fostering in our students a lifelong affinity for using technology to enhance their learning and enrich their lives. Upon graduating from Collegiate, students should be able to use modern technological tools to research, synthesize, and communicate information and ideas creatively; understand how to build and utilize online communities to create their own personal learning networks; communicate and work collaboratively; discern accurate and legitimate online information from that which is erroneous or questionable; utilize technology appropriately, responsibly, and ethically, while encouraging others to do the same. Our goal is to expose our students to the active practice of the art of theater; therefore, empathy, metaphor, collaboration, kinetic understanding, discipline, playfulness, and creativity are central activities. Our mission is to present theater studies as an academic area of the school's curriculum; to construct a discourse that does not separate acts of knowing from doing, theory from practice, or life from art; to value the qualities of gratitude, forgiveness, optimism, courage, and love; and to strive to help our students to see meaning and to find satisfaction in their lives and in the lives around them. a synthesis of skills, intellectual understanding, and self expression realized through a rigorous curriculum including an ambitious production program. We expect our students to be able to recognize and employ empathy in their creative work, their school lives, and all their future interactions. 2) We teach the special vocabulary and techniques of theater and film at each appropriate age level to the service of narrative/metaphor-making which gives students tools for finding meaning and purpose in their lives. We expect our students to recognize in critical and dynamic terms that metaphors emerge from the body to become part of the theoretical structures -- the organization of consciousness - through which we perceive the world. 3) We emphasise the role of active collaboration in creative work and the temporal nature of theater art (and of our lives) at each appropriate age level. We expect that our students will come to appreciate that there are other ways of understanding the world and what the world implies than through the mind; that the body's understanding is as deep as and, in the deepest cases, inseparable from the mind's understanding: that an unarticulated subtext may be more meaningful –literally full of meaning- than a text; and that a prepared intuition, an educated instinct, may be the deepest and surest way of knowing of all. 4) We address creation through discipline and playfulness at each appropriate age level. We expect our students to have the tools to knowledgably appreciate and/or participate in theater throughout their adult lives, retaining the inventive playfulness of youth focused and deepened by the discipline of maturity. Theater teaches play -- something harder and harder to learn after childhood, when what Wordsworth calls "the shades of the prison house" close in on us. Our students are prepared for the aesthetic, emotional, and spiritual demands their futures while creating works of utility and significance in the present. Collegiate students will have a basic understanding of and be able to apply the formal concepts of visual design through composition, color theory, and graphic rendering. Throughout the curriculum, students will link these formal design concepts to both two dimensional and three dimensional designs. Students will have an essential perspective of the visual arts in relationship to the larger context of the Fine Arts. Students will be able to reflect critically about their own creative designs, demonstrate an appreciation of the history of the visual arts, and be able to identify the expanding importance of visual literacy within their continuing education. Collegiate School strives to educate each boy to reach his highest level of intellectual, ethical, artistic, and physical development. Drawing on what is known about boys' growth and learning, the school offers a rigorous K-12 program rich in opportunities for cultivating individual talents and interests in a climate of collaboration and respect. Collegiate continues its historic tradition in New York City of educating a diverse and talented student body and of helping boys to become independent adults and responsible citizens who will lead and serve.